The focus of CIRCLean is to establish document exchange even if the used transport layer (the USB stick) cannot be trusted or if there is a suspicion about whether the contained documents are free of malware or not. 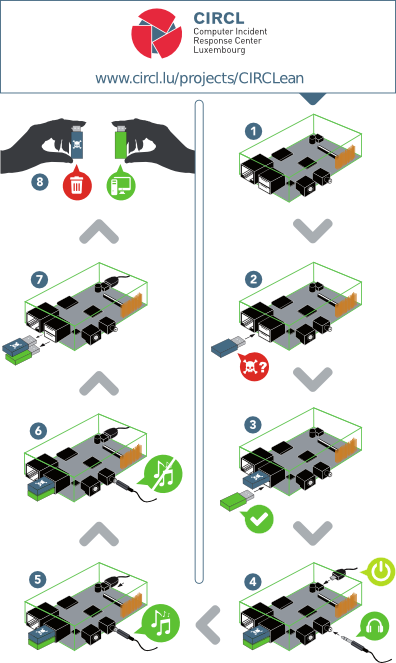 In the worst case, only the CIRCLean would be compromised, but not the computer reading the target (trusted) USB key/stick. The code runs on a Raspberry Pi (a small hardware device), which also means it is not required to plug the original USB key into a computer. CIRCLean can be seen as a kind of air gap between the untrusted USB key and your operational computer. CIRCLean does not require any technical prerequisites of any kind and can be used by anyone. CIRCLean is free software which can be audited and analyzed by third-parties. We also invite all organizations to actively reuse CIRCLean in their own products or contribute to the project. CIRCLean is designed to be used by everyone and the following visual shows how to use it in 8 easy steps. The visual instructions how to use CIRCLean is available in vertical PDF format and horizontal PDF format.